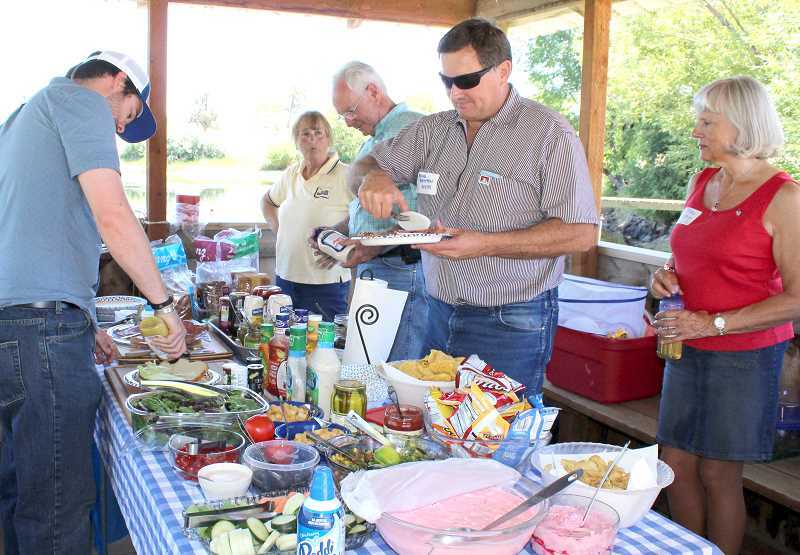 Jefferson County Farm Bureau, Central Oregon Seeds sponsor educational agricultural tour. On an educational tour of local farms last week, officials learned about soil, irrigation, and crops in the 58,833-acre North Unit Irrigation District. Hosted by the Jefferson County Farm Bureau and Central Oregon Seed Inc., tour leaders set out to inform representatives from the area offices of U.S. Sens. Ron Wyden and Jeff Merkley, and a few others from county, state and an environmental organization about the efforts of local farmers to efficiently manage their land and water in the district. Farmer and Farm Bureau member Gary Harris told the gathering that while NUID is the second largest irrigation district in the state, it holds junior water rights in the Deschutes Basin. 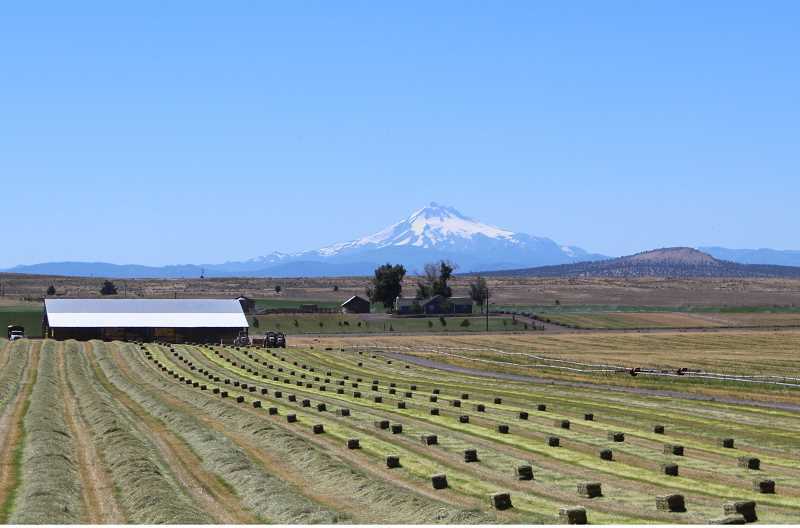 "We have the soils, climate and elevation that affords the growers the greatest economic benefit in Central Oregon," he said. Through the use of gated pipe, drip irrigation, low-pressure pivots, and tail water and waste water pump backs, Jefferson County farmers have managed to grow crops that typically require 3.5 acre-feet of water with only 2.1 acre-feet of water, Harris pointed out. The district has piped more than 43 miles of lateral pipelines and lined 12 miles of its main canal in recent years to reduce water losses and make the district more efficient. Martin Richards, NUID board chairman and owner of Fox Hollow Ranch, where the group ate lunch, said that with all the district's piping projects, "In my personal opinion, North Unit is probably the most efficient (of the eight Central Oregon irrigation districts) because we're junior water rights holders and have to make do with what we have," he said. Water for NUID is primarily stored at Wickiup Reservoir, located about 60 miles southwest of Bend. As of July 11, the reservoir had 80,104 acre-feet of water, compared with 126,236 acre-feet of water on July 11, 2017. "Conservation is key to keeping North Unit viable," said Richards. "The reservoir is going down quick; we're going to be starting at a deficit next year." Because the water level in the reservoir is so low, the district set an allotment — 2.25 acre-feet per acre for Deschutes River water right lands, and 1.25 acre-feet per acre for Crooked River water right lands this year. As part of the allotment, the district requested 10,000 acre-feet from the Prineville Reservoir, as it did in 2016 — another dry year, according to Mike Britton, NUID manager. When the water runs out, no more will be available. "In good years, you can use as much as you want," said Britton. Over the years, the crops grown by Jefferson County farmers have changed, from the wheat and ladino clover of the early days to potatoes, mint and garlic, to seed crops. A constant has been the forage crops, which make up slightly more than half the total of all crops in the district. NUID has about 29,482 acres of pasture, orchard grass and alfalfa — all big water users, noted COSI Manager Mike Weber. Cereals, including wheat, are grown on only 3,714 acres — about 6 percent of the district's total acreage. Seed crops make up another 15,680 acres, with 8,905 acres devoted to grass seed and 4,284 acres to carrot seed. The county produces about 40 percent of the world's carrot seed each year. Last year, vegetables accounted for 982 of the total acreage, with the largest acreage — 243 acres — devoted to garlic, and only 21.3 acres to potatoes — once a major crop for the county. "Most have gone to strictly potato seed," said Weber, explaining that about a decade ago, Northeast Oregon showed that it could grow potato crops with at least a 40 percent higher yield. "You've got to meet a certain standard. We couldn't compete on yield and quality specifications," he said. "With potato seed, there's still risk, but as (Culver farmer) Richard Macy would say, 'If you're careful with management and disease control, you can meet the standard.'" Citing potatoes and onions as examples, Weber said that if farmers increase their acreage, they might oversupply the market, "whereas with potato seed, you have a contract. If you meet the standard, it's a good return." "In farming, there's so many factors; you've got weather, bees, growing conditions," he said. But, so far this year, those factors have remained positive. "We're looking forward to a pretty good crop this year." Two years ago, the Center for Biological Diversity and WaterWatch filed lawsuits alleging that the U.S. Bureau of Reclamation and three irrigation districts, North Unit, Central Oregon and Tumalo, had violated the Endangered Species Act based on their operation of their reservoirs, and the effect that operation was having on the Oregon spotted frog, which is listed as "threatened." The judge deciding the case ordered a judicial settlement process, which took about five months. Under the October 2016 settlement agreement, the irrigation districts agreed to modify their operations to ensure minimum instream flow in the Upper Deschutes River of 100 cubic feet per second from mid-September to the end of March, and the environmental groups agreed to drop their lawsuits. In order to ensure the minimum flow, Central Oregon irrigation districts are hoping to apply for funding for irrigation improvements through the federal Natural Resources Conservation Service's Watershed Protection and Flood Prevention program — or PL-566. "We'll go after PL-566 money," said Britton, who is also the president of the Deschutes Basin Board of Control. Several of the irrigation districts have completed system improvement plans and have started their watershed plans, which take one to three years to complete. "The irrigation districts in Central Oregon chose to work in a collaborative way," said Britton. "They reached out and educated the public and environmental groups that switched from being adversaries to being partners. Without all the partners working collaboratively and all the work we've done, we wouldn't be where we are today. For Jefferson County, this is the economics." 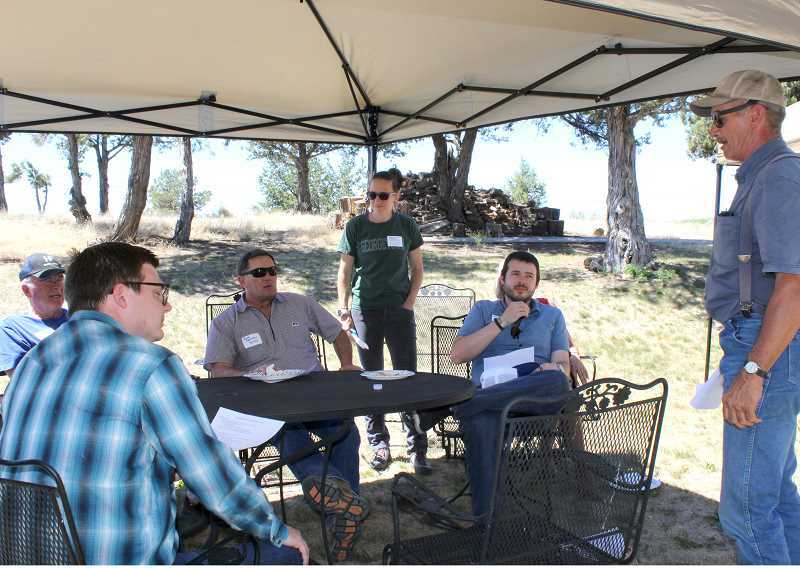 Jacob Egler, of Bend, special projects coordinator for U.S. Sen. Ron Wyden, said that he learned quite a bit about the technical processes of farming, and how important specialty crops — such as mint oil — are to the region. "Different factors play into how valuable the land is to grow; it's not dependent on any one factor," he said. Egler, who grew up in Ohio and spent time on his grandparents' farm, which grew corn, soy and wheat, was surprised by the diversity of the crops. "It's very different when you look at the level of specialization," he said. "It was a very educational tour. I look forward to taking what I learned back and sharing it with the senator." B.J. Westlund, of Bend, who works for U.S. Sen. Jeff Merkley, spent the first few years of his life on a cattle ranch in Jefferson County. "We moved to Tumalo by the time I was 4 or 5," he said, noting that his father, the late state treasurer Ben Westlund, had a bovine genetics operation there. Westlund was interested in the different soil types, and the fact that "it can vary from field to field," as well as crop rotation and specialty crops, such as potato seed. Meriel Darzen, circuit rider and staff attorney for 1000 Friends of Oregon, also enjoyed the tour. "It was great," she said. "I'm always surprised at how much agricultural diversity there is."